Use of chemical surfactant in cosmetic products has aroused worldwide alert due to its toxicity. Thus, in search of biocompatible and low toxic alternative surfactant, bacterial biosurfactant are attracting more attention towards manufacturing of industrial product. In the present study biosurfactant extracted from Pseudomonas sp. was used in the designed formulation of toothpaste. The efficacy of developed biosurfactant based toothpaste was analyzed through comparative study with commercial toothpaste. The analyzed involves qualitative test like abrasiveness test, spreadability test, determination of bacterial load, cleaning test, removal of yellowness of the teeth and toxicity analysis. The results indicate that biosurfactant based toothpaste formulation are efficient and less toxic. Hence, biosurfactant based toothpaste could open a new vista to cosmetic industries with safe product. Toothpastes are the essential cosmetic commonly found and sold in sachets or flexible tubes for the removal of dental plaque and food debris from the mouth, promotion of oral hygiene, and for elimination of halitosis from the mouth . Toothpaste comprised of several ingredients such as a binder (hold the ingredients together) such as sodium alginate, baking soda, a foam based compound which helps to remove food debris from the teeth e.g., sodium lauryl sulphate, an ingredient called a “humectants” which ensures that the toothpaste is moist, a flavoring agent like mint or sweetener, fluoride, water and antibacterial agent (prevent gum disease). There are few chemical such as sodium lauryl sulphate that are used in the toothpaste that harm our body health . Hence, much attention has been paid in search of biocompatible and low toxic alternative surfactant. Bacterial biosurfactant are attracting more attention towards manufacturing of industrial product. Biosurfactant are amphiphilic molecule produced by both bacteria and fungi and have surface active properties [3-5]. They have special advantage over the chemical surfactants, as they are non toxic, highly biodegradable, better environmental compatibility, high foaming ability and specific activity at extreme temperature, pH, and salinity. In present time biosurfactant are used in environment, food, petroleum, pharmaceutical and other industries as these are environment friendly and easily degradable [5-8]. Hence, in present study biocompatible and less toxic biosurfactant based tooth paste formulation is design and its efficacy was determined to developed safe product. Biosurfactant used in present study was extracted from Pseudomonas sp. The bacterial strain was tested for biosurfactant production on minimal salt medium, MSM (composition g/l CaCl2: 0.1, FeSO4: 0.01, KH2PO4: 1.0, KCl: 0.1, MnSO4: 0.002, MgSO4 (anhydrous): 0.5, NH4NO3: 0.39, NaNO3: 2.5, Na2HPO4: 5.67, dextrose: 15), incubated at 30°C for 72 hours with shaking at 150 rpm. Biosurfactant was screened by drop collapse test . Surface tension reducing ability was measured by following the method of formula of Viramontes Ramos et al., 2010 and emulsification index E24 (%) was determined by following the method of Cooper and Goldenberg, 1987 [10,11]. Seventy two hours grown bacterial culture in MSM with 150 rpm shaking on rotatory shaker was centrifuged at 10,000 rpm, 4°C temperature for 20 minutes. The culture supernant (crude biosurfactant) obtained was collected and stored. Crude biosurfactant was acidified and further extracted with diethyl ether using a separating funnel [12-14]. In a glass beaker, 5g of baking soda, 1.5 g of common table salt (sodium chloride), 1.5 g of calcium carbonate and 5ml crude glycolipid biosurfactant were taken and mixed with 4 ml of glycerine and was stir as thoroughly as possible. Stirring was done until the mixture has about the same consistency as commercial toothpaste . Abrasiveness test: Pea sized amount (1-2 g approx.) of commercial toothpaste and formulation toothpaste were placed on two different clean slides and one drop of distilled water was added on each toothpaste sample. With the help of cotton swab each toothpaste sample was rubbed in back and forth motion for 25 times using short 1 cm stroke. Then carefully the slides were rinsed off and dried with soft tissue paper. Each slide was examined under microscope and the amounts of scratches are determined on the surface of the slide . Determination of spreadability: Both pea sized amount of commercial toothpaste and bioformulation toothpaste was placed on the centre of the wooden table and pressed by weighted flat and plain surface wood. After 10 minutes, the weight is removed and the diameter of the paste is measured in centimeter . The experiment was performed thrice. Determination of bacterial load: To determine the microbial load on the teeth after brushing, both formulated and commercial toothpaste was brushed on human teeth procured from medically certified dentist. After brushing the teeth were dip into sterile distilled water for few minutes and the sterile distilled water is used to determine the microbial load (CFU) between 3 hour, 6 hour, 12 hour and 24 hours by spreading on agar plate by serial dilution. Cleaning test: Cleaning ability of the commercial and formulated tooth paste were determined by brushing the teeth respectively with both the paste. Removal of yellowness of the teeth: To remove the yellowness of the teeth, each tooth was treated with 1 gm turmeric powder for 24 hours, due to which the teeth developed yellowness and than after teeth were brushed with formulated and commercial toothpaste respectively. Toxicity assay: Toxicity of industrial products is one of the immense problems of recent time. Hence in order to reduce the toxicity many new formulations have been developed. So, in present study the toxicity test was important aspect to prove better performance of developed bioformulation as the biosurfactant are non toxic and biodegradable in nature. The toxicity was performed on the basis of its toxicity toward seed germination index. Briefly, for determining toxicity assay mustard and wheat seeds were surface sterilized with 0.1% aqueous HgCl2 solution. Toxicity was determined in sterilized Petri dishes (10 cm) containing Whatman No.1 filter paper. Ten seeds were placed in each Petri dish, followed by addition of 5ml of commercial and formulated toothpaste wash solution at room temperature. After five days of incubation relative seed germination, relative root length and germination index was determined . The test strain Pseudomonas sp showed positive for biosurfactant production as the drop spread and collapsed in drop collapse test. Biosurfactant produced by the strain showed potential in emulsification of engine oil and surface tension reduction. Toothpaste shows various functions, such as removing strain on tooth through abrasion, cleaning oral cavity. Cleaning particles are an important component of toothpastes, if the toothpaste is too abrasive, the tooth enamel can be damaged over time. The damage can be even more pronounced in the dentin . Abrasive test: Toothpaste’s abrasiveness is measured by its Relative Dentin Abrasively (RDA). According to RDA value 0 to 70 RDA value indicates low abrasive, 70 to 100 values indicate medium abrasive, 100 to 150 showed highly abrasive and 150 to 250 indicates regarded as harmful limit . So, here in case of abrasiveness taste the result showed that commercial tooth paste and bioformulation toothpaste has nearly same abrasive particle because of that reason the scratches are same in both the toothpaste (Figure 1). Spread ability test: Spreadability was another characteristic of toothpaste. It showed the consistency of paste. Basically the toothpastes are homogenous in nature and it should not separate into liquid and solid ingredients. The large spread area has shown the good consistency of toothpaste . The results of spreadability of both the paste were shown in figure 2. Effect on bacterial load and cleaning ability of the tooth pastes: The purpose of toothpaste formulation is to reduce bacterial flora of the mouth and oral cavity . In oral cavity food digestion starts such as breakdown of carbohydrate, protein, vitamin, fat and oil. Mouth bacteria help to break down the carbohydrate into acids and also feed on leftover food in the mouth . There are various types of mouth bacteria compromises of both useful and harmful effect example Neisseria, Haemophilus, S. pneumoniae, Porphyromonas gingivalis, Diphtheroid, Fusobacteria and Staphylococcus. Most of this mouth bacteria cause toothache, tooth decay and tooth plaque . 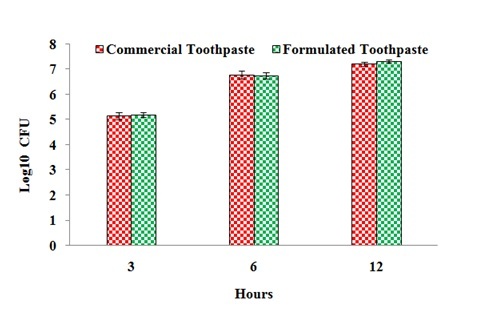 The formulated toothpaste showed good antibacterial property and reduce bacterial flora at the same rate as that of commercial toothpaste, with best result at 12 hours (Figure 3). One of the important characteristic of toothpaste is cleaning ability. The cleaning ability of the formulated toothpaste is similar to that of commercial toothpaste. Yellowness of the teeth: Tendency of the formulated toothpaste to remove yellowness of the teeth is shown in figure 4. Toxicity analysis: Toxicity of cosmetics products is one of the immense problems of recent time. Hence in order to reduce the toxicity many new herbal and environmental friendly formulations have been developed. So, in present study the toxicity test was important aspect to prove better performance of developed toothpaste formulation as the biosurfactant are non toxic and biodegradable in nature. The toxicity was performed on the basis of its toxicity toward seed germination index (Figure 5). The present results indicate that the formulated detergent is less toxic in nature. Chemical surfactants are toxic in nature according to many research and reports and hence biosurfactant are excellent emulsifiers with foaming properties, non toxic and biodegradable in natures and has great potential cosmetics industry. Hence, it may conclude that bacterial biosurfactant can be best alternative surfactant in cosmetic formulation. The authors have read and approved the final manuscript and there is no conflict of interest with the authorship. The research support received form DST Inspire programme to author Amar Jyoti Das is duly acknowledged. Regös J, Hitz HR (1974) Investigations on the mode of action of Triclosan, a broad spectrum antimicrobial agent. Zentralbl Bakteriol Orig A 226: 390-401. Bondi CAM, Marks JL, Wroblewski LB, Raatikainen HS, Lenox SR, et al. (2015) Human and Environmental Toxicity of Sodium Lauryl Sulfate (SLS): Evidence for Safe Use in Household Cleaning Products. Environ Health Insights 9: 27-32. Cameotra SS, Singh P (2009) Synthesis of rhamnolipid biosurfactant and mode of hexadecane uptake by Pseudomonas species. Microbial Cell Factories 8: 16. Nwakanma C, Ejim CJ, Unachukwu MN (2014) The Effects of selected toothpaste on the microbial flora of the mouth of GOU Student. Int J Curr Microbiol App Sci 3: 785-792. Tuleva BK, Ivanov GR, Christova NE (2002) Biosurfactant production by a new Pseudomonas putida strain. Z Naturforsch C 57: 356-60. Das I, Roy S, Chandni S, Karthik L, Kumar G, et al. 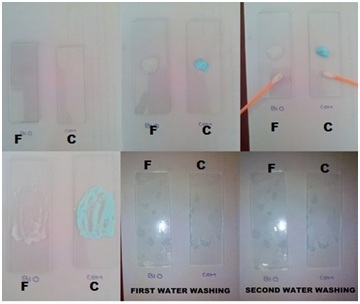 (2013) Biosurfactant from marine actinobacteria and its application in cosmetic formulation of toothpaste. Der Pharmacia Lettre 5: 1-6. Santos DKF, Rufino RD, Luna JM, Santos VA, Sarubbo LA (2016) Biosurfactants: Multifunctional Biomolecules of the 21st Century. Inter J Mol Sci 17: 401. Das AJ and Kumar R (2016) Bioremediation of petroleum contaminated soil to combat toxicity on Withania somnifera through seed priming with biosurfactant producing plant growth promoting rhizobacteria. J Environ Manage 174: 79-86. Bodour AA, Drees KP, Maier RM (2003) Distribution of biosurfactant-producing bacteria in undisturbed and contaminated arid Southwestern soils. Appl Environ Microbiol 69: 3280-3287. Viramontes-Ramos S, Cristina Portillo-Ruiz M, Ballinas-Casarrubias Mde L, Torres-Muñoz JV, Rivera-Chavira BE, et al. (2010) Selection of biosurfactan/bioemulsifier-producing bacteria from hydrocarbon-contaminated soil. Braz J Microbiol 41: 668-675.
Cooper DG, Goldenberg BG (1987) Surface-Active Agents from Two Bacillus Species. Appl Environ Microbiol 53: 224-229. Gandhimathi R, Seghal Kiran G, Hema TA, Selvin J, Rajeetha Raviji T, et al. (2009) Production and characterization of lipopeptide biosurfactant by a sponge-associated marine actinomycetes Nocardiopsis alba MSA10. Bioprocess Biosyst Eng 32: 825-835. Pansiripat S, Pornsunthorntawee O, Rujiravanit R, Kitiyanan B, Somboonthanate P, et al. (2010) Biosurfactant production by Pseudomonas aeruginosa SP4 using sequencing batch reactors: Effect of oil-to-glucose ratio. Biochemical Engineering Journal 49: 185-191. George S, Jayachandran K (2013) Production and characterization of rhamnolipid biosurfactant from waste frying coconut oil using a novel Pseudomonas aeruginosa D. J Appl Microbiol 114: 373-383. Tiquia SM, Tam NFY, Hodgkiss IJ (1996) Effects of composting on phytotoxicity of spent pig-manure sawdust litter. Environ Pollut 93: 249-256. Okpalugo J, Ibrahim K, Inyang US (2009) Toothpaste formulation efficacy in reducing oral flora. Trop J Pharm Res 8: 71-77. Figure 1: Abrassive test of the toothpastes. 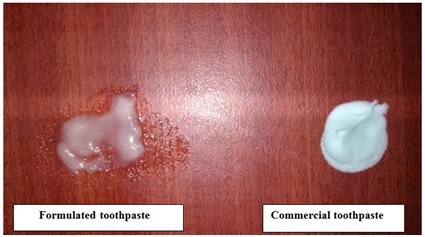 Figure 2: Spreadability test of Toothpaste. Figure 3: Bacterial load in the teeth after 3,6,12 hour of brushing. 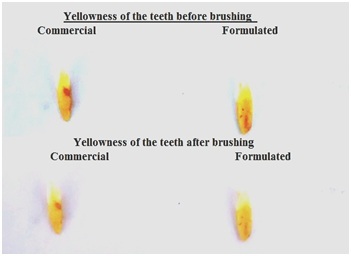 Figure 4: Yellowness removal test of the toothpastes. Citation: Das AJ, Ambust S, Kumar R (2018) Development of Biosurfactant Based Cosmetic Formulation of Toothpaste and Exploring its Efficacy. Adv Ind Biotechnol 1: 005. Copyright: © 2018 Das AJ, et al. This is an open-access article distributed under the terms of the Creative Commons Attribution License, which permits unrestricted use, distribution, and reproduction in any medium, provided the original author and source are credited.